The Japanese card of the day is a single Rare from V-BT01: UNITE! TEAM Q4, Prowling Dragon Striken. 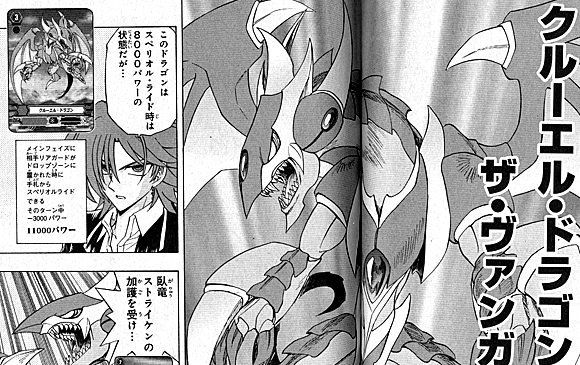 A Kagerо̄ unit first introduced in chapter 5 of the manga, Striken went almost unchanged in the transition from the original TCG to Standard. A slight buff to his skillset makes him more palatable to Kagerо̄ cardfighters, but it comes with a trade-off. CONT [Vanguard Circle]: This unit cannot attack. AUTO: When you ride a grade 3, by paying [Counterblast 1], draw 1 card, and during that turn 1 of your vanguards gets Power +5000/Critical +1. In exchange for giving up a drive check and an attack on your grade 2 turn, Striken makes it back up to you with a draw and an extra critical. 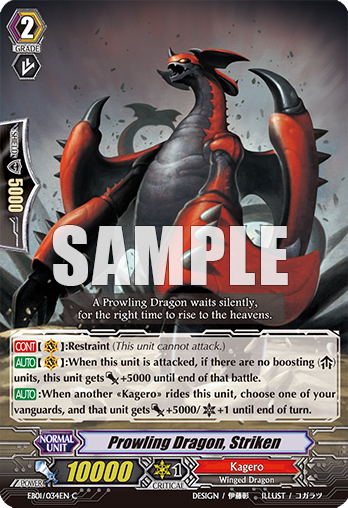 This might seem like a straight negative at first--after all, you're giving up a potential damage and trigger just to get it back for a counterblast next turn--but the real asset of Striken is how he interacts with the recently-revealed Dragonic Overlord. Overlord's once-per-turn skills respectively give him a 10k buff and the ability to restand after his attack has hit; combine this with Striken and you have a 28k 2 critical vanguard with an opportunity to deal 4 damage in a single turn before factoring in actual triggers. Historically speaking, Striken was used in a similar way late in the life of the 2011 Overlord-Goku deck, one of the earliest competitive Kagerо̄ decks. 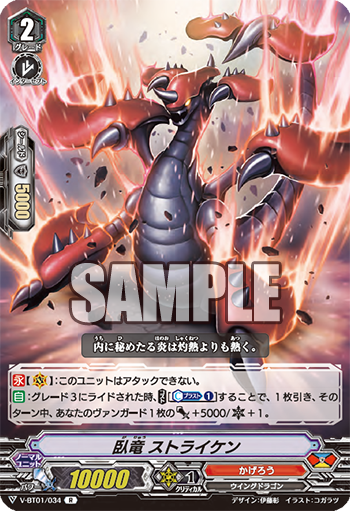 The downside to this is that it's easily stopped with a perfect defense card, but it's also a very cheap maneuver that rids the opponent of one of (on average) two they'll see from their playset. Versus Accel and other Force decks, staring down an Overlord that will so easily end the midgame and send them straight to the late is devastating; on the other end of the spectrum, Protect clans are likely to shrug off the play as a direct result of having double-or-more the number of perfect guards. The loss simply isn't as significant in a draw-heavy deck that gets another Sentinel unit every time it rides a grade 3. Those matchups are more likely to play out like the Tsukuyomi-Goku slow grind of the BT03 days. One element of Striken that was lost in the transition is his defensive value. 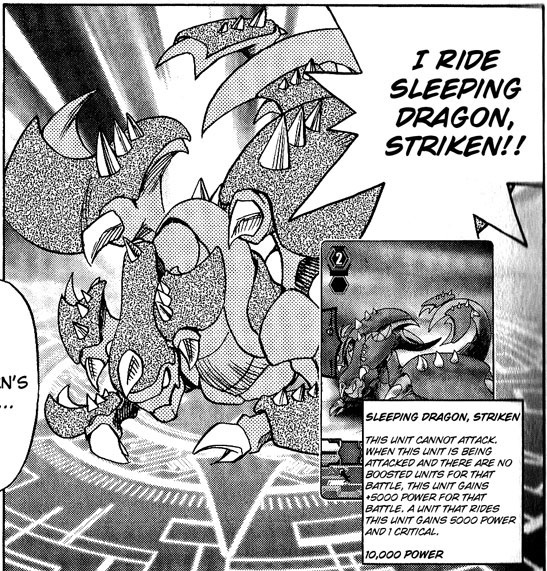 In both the original manga and card game, Striken was envisioned as a unit that gained power when attacked by unboosted units, preventing the opponent from rushing him down while his fighter's hand was still low from not attacking the previous turn. Striken now replenishes your hand for a cost, but being a base 10k isn't as walling as it was in the old format. (We currently know of only one 9k grade 2.) For a totally clean transition from EB01, Striken would need to be an 11k base that also gained power while being attacked--instead he gives us compensation on our lost card advantage, which is a bit messier since the cards conserved from not having to guard could very well be greater than simply maintaining the same level of card advantage. There's also the issue that Striken hasn't totally scaled with the power of the game. The old Striken was essentially a guaranteed critical trigger in exchange for a dead turn, but the new Striken only gives half as much power as an actual crit. And while Striken is designed to be a strategic investment, whether or not that investment will pay off is at least partially matchup dependent, which isn't something you want to hear when said "investment" involves the real possibility of having only one ride option for the turn. One upshot of the card is the role it plays in counterblast denial, particular when going first. The new format has already shown us cards like Knight Squire Allen and Alfred Early that use their counterblast skills on-place, and encourage conserving cards to call at the right moment rather than immediately rushing in. Leaving the opponent at 0~1 damage for a turn forces them to pace their deck and pinch those on-place skills rather than spam them, as well as choose between cards like Allen and Jarron. The alternative is that they choose to lose their opportunities to gain card advantage and switch to vanilla attacking--all because you rode a grade 2 that gives you the "benefit" of skipping a turn. Cruel Dragon, a grade 3 that could be ridden during the main phase if an opponent's rearguard was retired. There are some unresolved questions brought on by the relatively unknown card pool of BT01. For example, at this time we don't know if Cruel Dragon is going to get remade inside 2018. 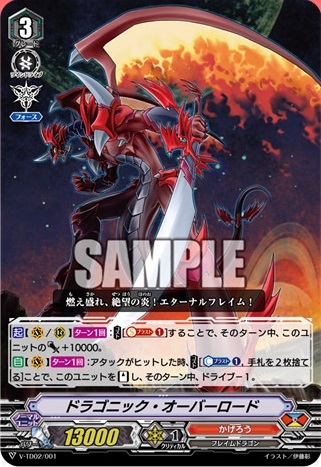 Having access to a grade 3 that can superior ride and bypass your grade 2 turn to negate the loss of an attack would make this incarnation of Striken a net +1 rather than a neutral exchange. These are questions that will have to be addressed as we go. Prowling Dragon Striken is designed by Itou Akira and illustrated by Kogaratsu, who also illustrated its card for Comic Style Vol. 1. The previous card of the day was the Knight of Silence, Gallatin.